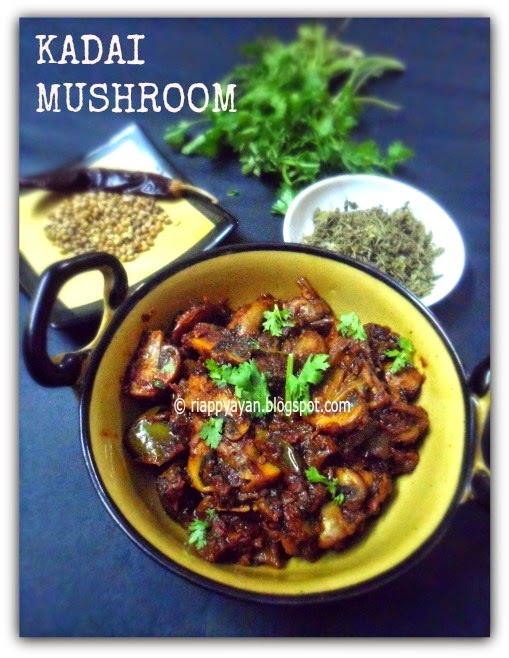 Kadai mushroom is an easy and quick dish and very delicious. Button mushrooms seasoned with an assortment of spices in a semi dry gravy of tangy onion-tomato sauce along with bell peppers. Mushrooms, onions, tomatoes and bell peppers - this combination never go wrong, brings out a flavorful dish always. The Indian Kadai is a deep bottomed pan, almost like Chinese Wok but deeper than wok. 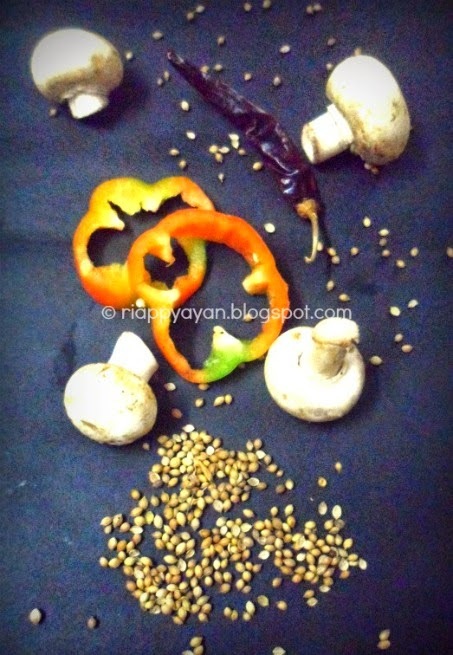 The dish is fully cooked in the kadai, hence got the name "Kadai" Mushroom. 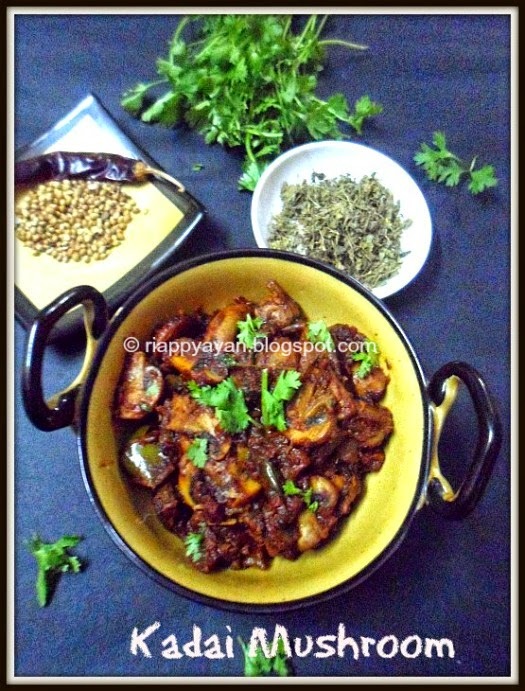 Also This Kadai Mushroom recipe hails from the Punjabi Cuisine where some specific spices go and make it do delectable. I usually use the store-bought spice powders but this time I thought to make it from scratch making my very own "Kadai" masala and needless to say, the taste was incredible, lot better than the other time I cooked the very same dish. And I promised myself to make any Kadai dish in future like Kadai Paneer with this freshly made masala. Button Mushroom : 250 gms. Coriander seeds : 1 tblsp. To make the Kadai Masala : Heat a griddle on high heat, add the spices one by one starting with red chilli first. Lower the heat to medium and stir continuously till a nice aroma of roasted spices comes out and spices turn a shade darker. Remove from heat, cool a little just enough to go inside a dry drinder/coffee grinder, grind when the spices are still warm to get the best aroma for the spices. You can store this grounded spice ina n air-tight container. Heat oil in a pan, add chopped onions, when they turn little brown, add sliced mushrooms. Mushrooms can loosed some water, stir fry till it evaporate. When all moisture has evaporated and mushrooms turn little brown, add green chilli and ginger-garlic paste. Mix well and saute for 2-3 minutes. Add tomato puree and sliced/cubed capsicums. Mix well and then add the grounded kadai masala we prepared. Mix very well and saute for another 2-3 minutes. Season with salt this time and add about 3/4 cup water. Cover the lid and let it cook in medium heat. Tip : Mushroom and capsicum both don't take much time to cook and as it's a semi-dry gravy dish, so don't add too much water. When gravy has nicely coated the mushrooms, add crushed kasuri methi from top and mix well with the gravy. Remove from heat and garnish with fresh coriander leaves. 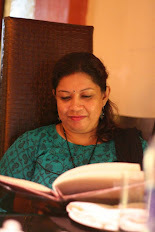 And your are done to relish an awesomely flavourful side dish with rotis, naans or parathas.